Notice how the grout lines went from dark to light and the tiles have a fresh clean look. San Diego homeowners called us because their grout lines would not come clean. Sweeping and mopping can only make so much of a difference when it comes to tile and grout floors. Eventually dirt, grime, grease, spills, dirty mop water, and other contaminants get trapped in the porous surface of grout lines. Our highly trained technicians deep cleaned and sanitized the floors using professional strength cleaning solutions and a floor machine designed to agitate and flush out contaminants from even the most dingy-looking grout lines. We thoroughly rinsed the floors using a high-pressure spinning tool, completely eliminating any residue. 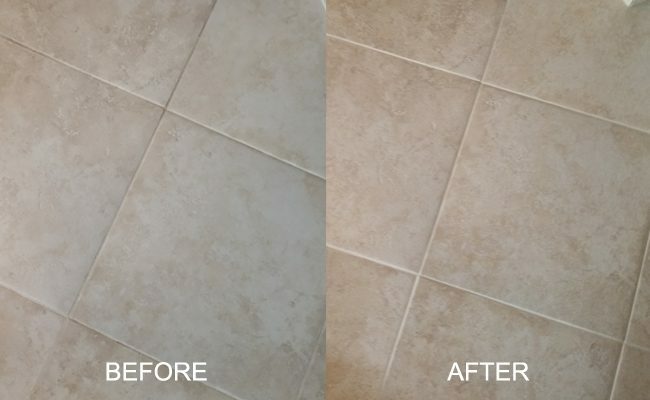 Our final step was to apply a color grout sealer to the grout lines to inhibit staining, make regular cleaning more productive, and dramatically improve the appearance of the grout. The homeowners were very happy to see their grout lines clean and fresh again. Need tile cleaning services? We provide residential and commercial tile cleaning services in the San Diego area. Contact us online or call 619-246-0240 today to discuss your tile and grout cleaning, sealing, and color sealing options.